Provides updated fuel moisture content data across different agencies. Dead fuel moisture maps produced by the USFS WFAS. An interagency incident information management system. California statewide map of major incidents that CalFire is managing or assisting with. Interactive national map of large incidents with data provided by the NICC. Fire detection maps derived from MODIS, VIIRS, AVHRR and GOES. Air quality information pertaining to North American fires from the Environmental Protection Agency (EPA). Provides map of severe fire weather potential across the contiguous U.S. Derived from the National Digital Forecast Database (NDFD) in combination with RAWS observations. 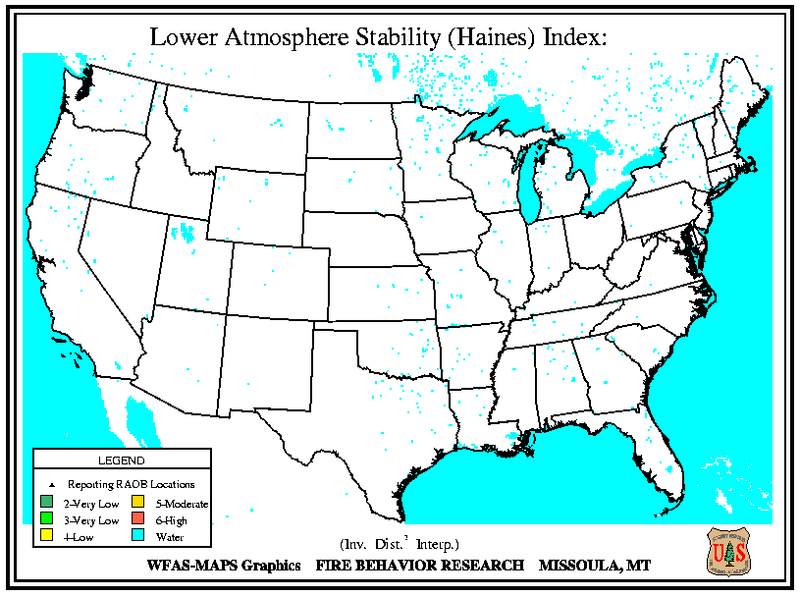 Daily map of Haines Index values across the contiguous U.S.
Fire weather outlooks up to 8 days ahead produced by NOAA's SPC, as well as additional fire weather forecast tools. National daily observed/forecast Fire Danger Ratings maps. Contains links to 7-day, monthly and seasonal Significant Fire Potential outlooks for each Geographic Area Coordination Center (GACC), and nationally. Daily probabilistic map of significant fire given ignition in the Western U.S.
An interactive tool displaying watches and warnings issued by the NWS, useful for the display of Fire Weather Watches and Red Flag Warnings. Additionally, you can overlay forecasts, surface observations, satellite imagery and radar. Homepage of the NWS. A national NWS forecast map may be viewed here. National interactive map showing current and past surface weather observations from numerous networks, including: NWS (National Weather Service), RAWS (Fire), SNOTEL (Mountain/snow), CWOP (Citizen Weather Observer Program). Updated MODIS satellite imagery by state for the contiguous U.S. Updated VIIRS satellite imagery by state for the contiguous U.S.
Daily national maps of observed dry lightning produced by the USFS WFAS.